Close your eyes and imagine a person whom you love to visit, a house where you simply feel welcome and at home, a place of hospitality. Now tell me, what does hospitality look like to you? Does it look like Pinterest, with perfect decor, beautiful table settings and picture perfect food? Does your friend appologize for a non-existent mess as she ushers you inside across gleaming floors? Are there games and activities lined up, or the perfect little place to sit and sip on iced tea and nibble ginger snaps? 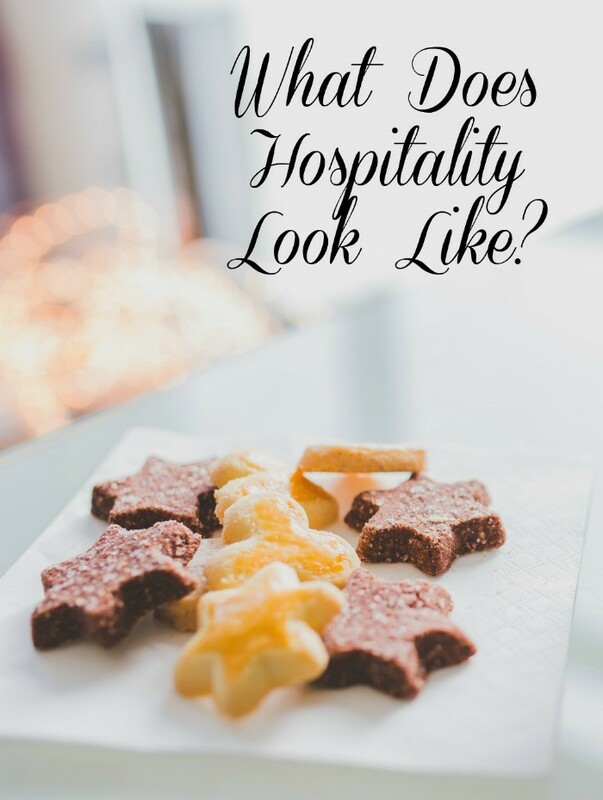 Hospitality looks more like a door flung wide open and a smiling face on a friend who’s just thrilled to see you. You don’t really have time to notice whether or not the house is clean because you are too busy catching up on all the news with your friend. You see, the first scene I described wasn’t hospitality. It was entertaining, and it’s often the reason we hold back from extending hospitality. We have this idea that things must be perfect, that the house must be clean and the food must be at least a 4 star presentation. Entertaining takes days of preparation while simple hospitality doesn’t need to. Too many times we think “I would love to have people over, but my house is a mess, or I just don’t have time to cook anything fancy”. While the truth is, you and I would be more than happy to be invited to a friend’s house for dinner and be served simple foods and lots of laughter. Why do we think our friends would expect more from us than we would want from them? 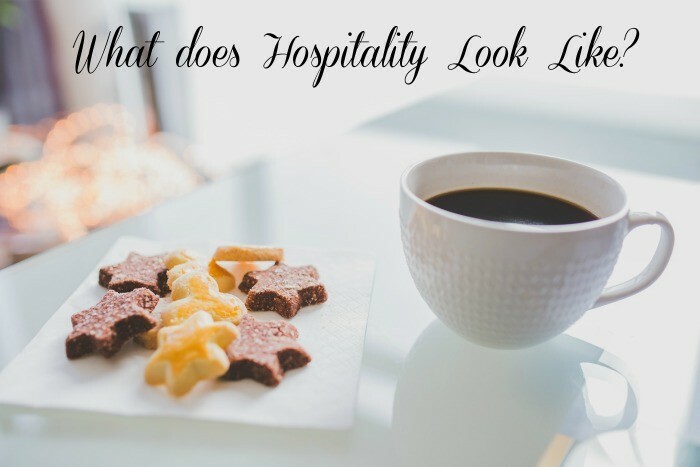 So, what does Hospitality look like to me? I make sure the bathroom isn’t horrible, my daily routine keeps it decent enough, but sometimes the toilet needs a little extra help. I grab a dust mitt and hit the places that look the worst, and if the toys are too out of hand, I kick them into the corner by the toy shelves and satisfy myself with whatever cleaning up my almost 2-year old does with them. If the floors look truly horrible I may vaccum quickly or dry mop. Food? We are blessed to have a full freezer and there’s almost always something to eat. Soups and sandwiches are easy. We typically have cookies available, and if the concentrate is made up I love to serve my guests a cup of chai latte. What does hospitality look like to my guests? Someone who is thrilled to see them and demonstrates it with a smile and a “come on in!”. A house that looks somewhat tidy, but no mention is ever made of the “mess” or anything else. A hostess who makes them feel comfortable by cozying down on the couch with them, and special by serving up a treat or drink in her good china. It is my hope that hospitality at the Stamy house represents love and laughter. Extend true hospitality without all the fancy trappings. You and your guests will have a much better time of it! A minister once preached a sermon on hospitality and he pointed out a lot of what I’ve mentioned above. He also said that he would be happy with just a pb&j when invited places. He felt that the fellowship was far better than fancy food. Thanks so much for hosting. God bless!! Love love loved this post! It’s the very heart of hospitality! Lovely post on hospitality! I just did a series on this on my own blog a couple weeks ago! I think this is sucha an important part of a woman/homemaker/wife’s life! Thanks for the link party too! 😀 Have a good week! We love having people over. No fancy house, but we love to cook and visit. We know our friends feel comfortable here, they’re always begging to come over, even the teens! Love that verse from Proverbs. So true. I rather have a simple meal but that’s full of love than be in a feast with so much hostility going on. I love this post! I worry so much about dust and pet hair at my house that I never invite rookie over. 😐Visiting your house is very warm and welcoming. I loved to just sit and chat with you and enjoy watching the boys! !